In computed tomography, algebraic reconstruction methods tend to produce reconstructions with higher quality than analytical methods when presented with limited and noisy projection data. The high computational requirements of algebraic methods, however, limit their usefulness in practice. In this paper, we propose a method to approximate the algebraic SIRT method by the computationally efficient filtered backprojection method. The method is based on an efficient way of computing a special angle-dependent convolution filter for filtered backprojection. 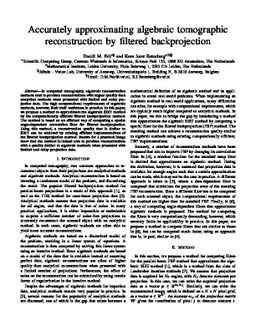 Using this method, a reconstruction quality that is similar to SIRT can be achieved by existing efficient implementations of the filtered backprojection method. Results for a phantom image show that the method is indeed able to produce reconstructions with a quality similar to algebraic methods when presented with limited and noisy projection data. Pelt, D.M, & Batenburg, K.J. (2015). Accurately approximating algebraic tomographic reconstruction by filtered backprojection. In M King, S Glick, & K Mueller (Eds. ), Proceedings of International Meeting on Fully Three-Dimensional Image Reconstruction in Radiology and Nuclear Medicine 2015 (pp. 158–161). None.